Here is my second post for my Valentine's Day Gift Guide Event and I am so glad you have joined me once again. :) Hope you are enjoying this event thus far. So, lets talk about candles. What would a romantic dinner be without a candle or two? Having two children, I cannot recall the last time I had a truly romantic dinner with my hubby here at home. I know we should make time for that, but we don't like our children being babysat very often and so our dates are few and far between. Maybe this Valentine's Day we should have a date, hmmmm? I am seriously thinking about that. So, when you think of a lovely candle to use for a romantic dinner or quiet evening at home, what scent is the most appealing to you? Chocolate? Vanilla? Strawberry? Well, if I am going for romance, I am thinking chocolate or vanilla. Recently I discovered a really lovely company that makes soy candles of every shape, size, color and scent. I am a particular fan of soy candles because of how clean they burn. I hate the black and sooty result of burning non-soy candles and many of my candles are not soy. Sooo, I end up having to wipe the insides of my jars when burning my candles to keep the black soot away. Self Essentials is a company that is found in New York City and they hand craft all of their candles. Self Essentials, Inc. is a soy candle company located in New York City that provides exceptional Soy Candles, Soy Pillar Candles, and Aromatherapy Soy Candles. All of our soy candles are handcrafted to order for our customers. We offer highly scented soy candles that are aromatic, beautiful, and are customized to your specification. We also offer a wonderful selection of natural aromatherapy soy candles made with 100% pure essentials oils. Self Essentials' products are not only natural, they are elegant. All of our products are beautifully packaged and will make wonderful gifts for your family and friends. I know so many people who RAVE about essential oils and I know how wonderful these oils are in lotions and creams. They also smell great so I was really excited to see how Self Essential's candles smell with these essential oils in them. 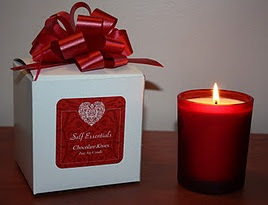 So, for this review I was sent a Frosted Red Valentine's Day Soy Candle in a beautiful gift box. I had my choice of several scents (Chocolate Kisses, Lick Me All Over, Sensual Seduction, Rose Petals and Unscented) and I chose Chocolate Kisses. This is a 7 ounce candle that smells beautiful when lit. Self Essentials suggests letting the candle burn for three hours in order to create an even burn. Mine has now been burning for about 2 hours and the scent is wonderful. 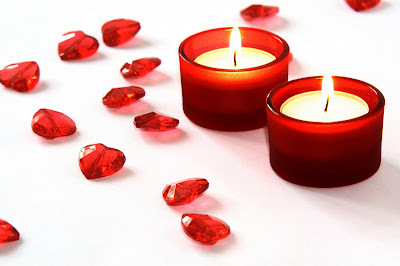 This candle looks really beautiful in a dark room when burning too...the red frosted glass glows very nicely and creates a very romantic ambiance. 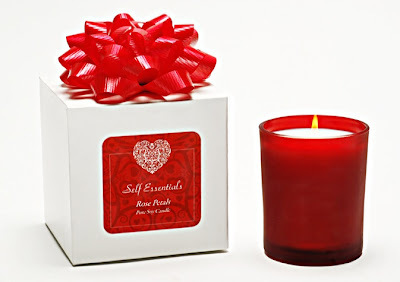 The Frosted Red Valentine's Day Soy Candle retails for $13.60 on Self Essentials website and would make the PERFECT gift for your Valentine. So, in my opinion...Self Essentials really knows how to make a great candle. The scent is perfect and the price is just right. I love the Chocolate Kisses scent and it really infused my whole kitchen when I lit it. I can think of a number of people who would love to receive this candle as a gift...including me!! Disclaimer: I received no monetary compensation for this post. I did receive a free Soy Candle for review purposes. All quotes and stock photos are from the Self Essentials website and email. Prize is being provided by the sponsor. All thoughts and opinions are 100% mine. What great choices! I would either get the Chocolate Kisses or the Apple Jack and Orange Peel. I would get the Natural Elegance Soy Candle (10 oz.) in Cinnamon Buns scent. I would buy the Frosted Tart Warmer (White). I really like the Butter Electric Combo Warmer and would choose the Lemongrass Sage Soy Tarts to go with it! I would buy the Natural Elegance Soy Candles (16 oz.) in Tangy Lemon. I think I would probably get a Natural Elegance Soy Candles (10 oz.) in Clean Cotton. Maybe some tarts too. I would get a Cinnamon Sticks Contemporary Candle. I would purchase the Twelve Soy Votives set.